Just like the gallery, the Bada 2.0 music player has been redesigned to look like the one in TouchWiz-skinned droids. The interface is laid out in four tabs for the available sorting options: all artists, all tracks, playlists and albums. The user interface looks even better when you use the music player in landscape mode. Browsing albums or tracks is pretty standard in portrait mode: you get a list of all songs or albums, each with a small thumb. The list is smoothly scrollable with impressive kinetic effect. If you're browsing in landscape mode you'll be getting an album art reel of virtual CDs. Tapping on a CD will expand it to show all the tracks within the selected album. Alternatively, sweeping down across the screen (from the arrow above the central CD) will display a virtual dial to let you search the albums or tracks alphabetically. 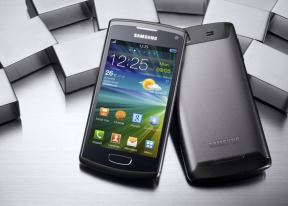 The Samsung S8600 Wave 3 is equipped with an FM radio with RDS too. The interface is simple – there’s a tuning dial and you can save as many as 8 stations as favourites that are accessible right on the main screen. The rest of the available radio stations are still a click away. You can also listen to the FM radio on the loudspeaker, but the headset is still needed as it serves as an antenna. FM audio recording is also available. The recorded files are stored in MP3 format in your music folder. The Samsung Wave 3 S8600 is a very capable musician for its class, but if you are looking for sonic perfection you'll have to take your business elsewhere. When connected to an active external amplifier, the Wave 3 is averagely loud with excellent noise level, dynamic range and stereo crosstalk readings. The total harmonic distortion is kept well under control as well, but the frequency response and intermodulation distortion are not quite ideal. With a pair of headphones plugged in, the Samsung Wave 3 S8600 experiences a rise in stereo crosstalk and gets a bit of extra interdmodulation distortion, but we're actually used to seeing worse from smartphones. 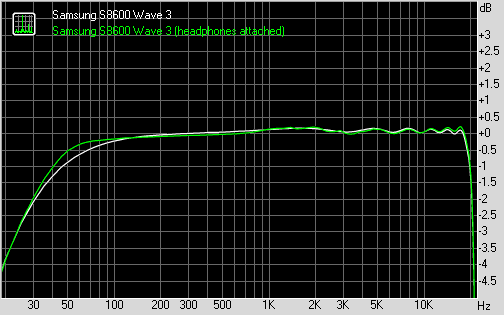 In fact the Wave 3 scores better in the headphones on test, compared to its competitors, than it did in the initial test.